If you are coming here from a search, welcome to my blog. I invite you to look at the sidebar to read some more on Judaism, Jewish holidays, Israel, baby names, and parenting. You can find more recent posts on the homepage. If you try the recipe please let me know how it turned out. For more recipes and techniques see my blog on efficient cooking, CookingManager.Com. Kugel (vegetable or noodle pudding) is out of style. It’s not particularly healthy or low-calorie. But it is Jewish, and everyone needs some Jewish comfort food once in a while. The key to successful potato kugel is keeping the potatoes white. Once those potatoes are grated, you must race to put the kugel in the oven before it starts to turn gray. Master this and you can call yourself a true balabusteh (Jewish homemaker). It’s also important to keep the grated potatoes from becoming mush, and to know when the kugel is ready. 8 peeled potatoes cut in quarters or eighths (you can prepare these in advance and place in a bowl of water). You can also sip peeling if the peel is thin. The exact proportions aren’t important and an extra potato or egg won’t make a huge difference. Grease a rectangular pan. My mother laid on the oil pretty thick but I have found that unnecessary. You could use baking paper without oil, but you will lose that traditional eastern European flavor. Greased baking paper makes for easy cleanup. Set the oven to 350° F (180° C). Technically preheating isn’t necessary, but it will keep the potatoes whiter. Some people recommend preheating the greased pan in the oven, but I stopped that the first time I burned myself while putting in the batter. You must use a blender or food processor to make white kugel; a hand grater won’t cut it (no pun intended). The potatoes will turn gray by the time you finish everything. If your processor is big enough you can mix it all together. Grate the potatoes and onions first with the steel “S” blade. Add the other ingredients and process briefly until mixed. When I make a large quantity like in this recipe, I put all of the ingredients except for the potatoes and onion in a large mixing bowl, then add the grated vegetables batch by batch. Here’s where you need to know your machine. You want to put in enough potatoes and onions to grate as few batches as possible. But if you put in too much, you end up with half mush and half large chunks. If you have never done this before, put one layer of onion and potato quarters in the food processor. Using the on/off or pulse function, start and stop the machine until it quiets down and the chunks stop flying around. Stop right away to avoid making mush. Empty the contents into the mixing bowl with the other ingredients. If you still have big chunks, fish them out and reprocess them. Important note: if the chunks have stopped flying but you can still see them stuck in there (because they are too big or too many), don’t belabor the point. Take out the big pieces and add them to the next batch. Don’t worry if you mess up; even mushy kugel will be tasty. Repeat until all the potatoes and onions have been processed and placed in the bowl. Mix it all together very well. And quickly. And take a moment to rinse off the processor and any utensils that touched the raw potato. You’ll thank me later. If you manage to process it all in one batch, you can add the other ingredients to the grated potatoes and onions and process until just mixed. Use a spatula to empty the mixture from the bowl or processor into the pan, and get it into that oven! When finished, the top, and not just the edges, should be brown and crispy looking. If you are using a glass pan you’ll notice that the sides will also be brown. If you’re not sure, check the bottom as well by lifting up the kugel from the pan with a spatula. I can’t give you a time because so much depends on the thickness. A really thick one can take up to an hour. 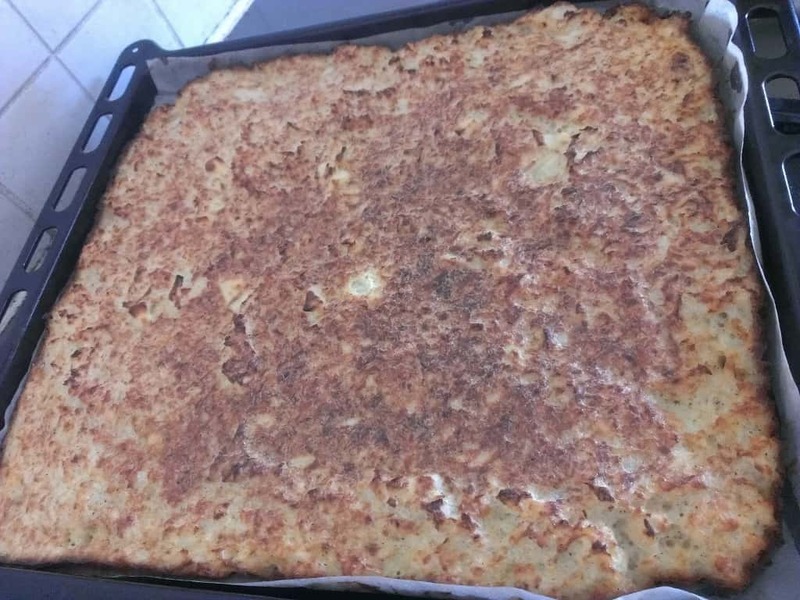 My daughter and I suspected that the kugel we made the other week wasn’t cooked through because it seemed soft, but when we served it it was white, moist, and completely cooked. If the potatoes don’t get cooked, the kugel will turn gray. Kugel can also be cooked on the stove on low heat in a greased frying pan. This might be more economical when your oven is otherwise empty. To save energy, my mother only turned on the oven when she was able to fill it. Kugel is great hot but my mother maintained that kugel was meant to be served at room temperature. She kept it on the counter overnight to serve for Shabbat lunch. Of course she didn’t live in the Tel Aviv climate, and I refrigerate mine. I don’t often freeze it, but I have read that it freezes well when slightly undercooked; you can finish baking it before serving. For more recipes and cooking techniques see CookingManager.Com. sounds great! make sure you submit it to the kosher cooking carnival at me-ander…. blend onions, oil, eggs, salt and pepper with the “S” blade of your processor. Pour into mixing bowl, Chop 1/2 the potatoes ( do this a little at a time, don’t overload the processor)until it resembles very small chopped up pieces, not quite mush,Pour into mixing bowl with the egg mixture. Grate the rest of the potatoes with the shredder attachment.Add to mixing bowl, Mix well, altogether. Pour into baking pans (can line them with parchment paper) Bake until nice and brown. I forgot to mention, you certainly can freeze this kugel. Just make sure you heat it up very well before serving so it doesn’t have that watery defrosted taste. Basmelech–Thanks for your variation and your comments on freezing! Your recipe is a little different from the cookbook one I use, but your method to do the work as quickly as possible is exactly what I do. I get the eggs, oil, potato starch (yes, even during the year – I got this recipe from a friend who can’t eat gluten, and it really comes out well!) salt & pepper in a bowl ready for the processed potatoes and onions to go right in. An extra step I like to do is to quickly plop the processed potatoes into a collander right before adding it to the eggs, etc. to get rid of some of the potato water. The recipe I make comes out as a full 9×13 pan size, which, since we’re not that many people, means I can either freeze half or wrap half in foil and let it sit on the chulent (when I make it) overnight. RM–my frugal mother a”h would never have thrown out vitamin-rich potato water LOL, so I don’t. WOZ–glad you liked it, we made small ones to distribute on Purim. I put all the grated potatoes and onions in a bowl of cold water and then squeeze them out. This takes out all the starch (Spice and Spirit Pesach cookbook uses this to make potato flour!) and stops the kugel from going grey. I throw out the water, but I suppose you could use put it into soup or something. Having always cooked my kugel on a very high light, I am now trying a thicker kugel cooked for a long time on a medium light. I use (ungreased) baking paper, but put a small amount of oil in the kugel, no salt or filler. I see you take out the starch, while Raggedy adds more. But maybe it is the extra water that is the problem, although I haven’t bothered to take the extra step. Thank you so much! I was going to grate all of the potatoes by hand – I didn’t even think to put them in the food processor (I’m obviously a novice). This is a great recipe – I’m going to make one for Passover tomorrow!